Would you like to be the saver of our world? Let's check all your skills! You have definitely heard that the biggest problem is a shortage of water. We propose you to try to solve it! Are you ready for such a challenge? Go ahead! Nowadays, as you know the biggest problem of modern society is the water. And we have found one of the best solutions of this great problem! In this game you have a fantastic opportunity to become the first person, who may save the whole planet from the dying out! Cool, yeah? So use all tips and do not let any drop to fall down. We are sure that you will cope with it at any rate. 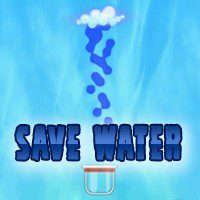 Do not waste your precious time and save the water! Be attentive enough and you will be thanked. Good luck and have a lot of fun!